The resignation of Hosni Mubarak, the Egyptian president, led the news. His departure came after weeks of protest in Cairo and other cities across the country. A 6.3-magnitude earthquake hit Christchurch, New Zealand. Speaking while the death toll was still rising, Prime Minister John Key said: "We may be witnessing New Zealand's darkest day." As a tsunami hit Japan, worldwide interest in the story made this the second busiest day for traffic to the BBC News website in 2011. There were more than 14.4m unique web browsers*. Chancellor George Osborne revised down the UK's forecasts for growth in his annual Budget statement. The 50% tax rate for the highest earners remained but fuel duty cuts were announced. Prince William and Kate Middleton were married in London's Westminster Abbey, with the eyes of the world upon them. The day of celebrations saw just under 9.5m web browsers* access the BBC News website. Osama Bin Laden's death at the hands of US forces was announced by President Barack Obama. Bin Laden is believed to have ordered the attacks on New York and Washington on 11 September 2001. It was the third busiest day on the BBC News website in 2011, with 11.7m browsers*. The singer Amy Winehouse was found dead at her north London home, aged 27. Later in the year, a coroner reported that the singer had died as a result of drinking too much alcohol. 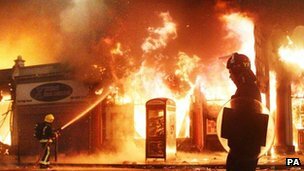 Rioting unexpectedly broke out in Tottenham, north London, on 6 August, before the violence spread to other cities, including Birmingham, Manchester, Liverpool and Bristol over the next few days. The shocking scenes helped make 9 August the largest day for traffic in the history of the BBC News website, with just under 15.9m browsers*. The Libyan ruler Colonel Gaddafi was killed, as his hometown of Sirte was overrun by the forces of the National Transitional Council. Initially it was unclear if he had been killed or just captured, but slowly gruesome mobile phone pictures emerged which showed beyond doubt that Gaddafi was dead. The British embassy in Tehran was attacked by demonstrators opposed to sanctions imposed by the UK. Militant students burned the British flag and smashed windows in anger at the British response to Iran's nuclear programme. A look back at the big stories on the BBC News website suggests it's been a tumultuous year, with uprisings across the Arab world, an earthquake in Japan and the deaths of Osama Bin Laden and Kim Jong-il. But can you instantly know if a year is going to go down in history, asks author Tim Footman. As 2011 staggers to a close, it does feel somehow more momentous than an ordinary year. Regimes have crumbled, despots and demagogues were toppled, cities blazed and capitalism itself started looking a bit rough. Even the speed of light changed, allegedly. Could this turn out to be a big, historical year to rank alongside 1989 (tanks in Tiananmen Square, dancing on the Berlin Wall), 1968 (tanks in Prague, riots in Paris, the death of Martin Luther King) or 1956 (Hungary, Suez, Elvis on the Ed Sullivan show)? It's probably fair to say that the top story has to be the Arab Spring, although as a historical event, it's still a work in progress. And there are still arguments as to whether it is best regarded as a single event or a series of discrete revolts; it's fair to ask if a single Tunisian street vendor had not reacted to official harassment, would events have played out in the same way. And there is always the matter of perspective. If you're not directly affected by events in North Africa or the Middle East, your own big headlines of 2011 might have been the births of the seven billionth child or South Sudan, the earthquakes in Turkey or New Zealand, the elections in Ireland or DR Congo or the deaths of footballer Socrates or singer Amy Winehouse. But two facts are clear. One is that there are very few big stories that remain purely local. The knock-on effects of the tsunami in Japan forced governments around the world to review their nuclear power policies. Economic woes in a handful of countries affected the whole eurozone and beyond. The "Indignant" protesters in Spain set the agenda - fluid and unfocused as it may have been - for the Occupy movements in New York and London and beyond. The floods in Thailand engulfed dozens of factories making electronic components, which means your next laptop or phone or games console may well cost more, wherever in the world you buy it. Followers of British politics will be sick of hearing it, but we really are all in this together. The other change is that the way in which we receive and consume news of these events has become as significant as the events themselves. The first inkling of the raid that killed Osama Bin Laden came not from President Obama's solemn press conference, but from one of the al-Qaeda leader's unwitting neighbours in Abbottabad, musing aloud on Twitter about the US helicopter that had suddenly disturbed his evening. As English cities smouldered after nights of guerrilla consumerism, politicians and pundits debated the logistics of suspending the social media sites with which marauding hoodies had supposedly plotted the riots. And how many people first got the news of Steve Jobs's death via one of his own devices? But it wasn't just the speed with which the news travelled, or the medium that carried it, that made 2011 stand apart from previous big years. The news itself, the whole convoluted question of what we should and shouldn't be allowed to know, hogged the headlines for weeks on end. Julian Assange went from crusading hero to arrogant, dangerous weirdo, depending on who was telling the story, but the questions raised by Wikileaks, of the extent to which governments should be entitled to keep secrets from the people who elect them, remain live topics. The super-injunctions saga in the UK prompted smirks and sniggers - again, many of them echoing around social media sites, which tend to be less nervous about libel laws - but did raise significant questions about whether public figures should be entitled to private lives. And then the phone-hacking scandal at Rupert Murdoch's News of the World, which had been rumbling for years, suddenly burst into public view, engulfing several careers, dragging several other newspapers into the argument and alerting us to Hugh Grant's middle name. There were, as in any year, a number of natural disasters but in terms of death toll no single catastrophe to compare with the Bam earthquake in 2003, the tsunami in 2004 or the Sichuan quake in 2008. That said it's an uncomfortable truth that people in the West have a more intense reaction to such events befalling advanced, developed places such as Japan and New Zealand, compared to the response when they happen elsewhere. So was 2011 really a big news year, like 1956, 1968 or 1989? Or is it just that each news story that rolls into view is now immediately seized on not just by the news media but by bloggers and Tweeters and Google+-ers who analyse it from every known political and religious and philosophical standpoint, with a good few conspiracy theories thrown in, so everything seems bigger and more complex - and usually far worse - than it might have done otherwise? And even those who don't see themselves as part of either mainstream or unofficial media have taken the chance to peek behind Oz's curtain, to see how politicians and journalists and bankers and lobbyists have tweaked reality to their own ends. In the end that - rather than any revolution or riot or earthquake or media scandal - may turn out to be the biggest, most historically significant story of the year.